Jucaro rhumba d'amor : for violin and piano / Margaret Brandman. Over the years, Margaret as composer/pianist has performed as a soloist or with many ensembles playing many styles of music from Classical to Jazz and Latin-American music. She has always loved the Latin-American rhythms and sought to explore this genre with her delicate violin melody superimposed over the Rhumba Rhythm established in the piano part. Commission info: Commissioned by Duo Deconet. 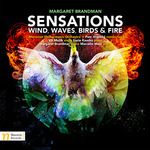 CD: Sensations : wind, waves, birds & fire / Margaret Brandman.